Florida fought. Florida scrapped. Florida defended. And Florida hung around until the very end. But against the tenth ranked Spartans of Michigan State, that just wasn’t good enough. 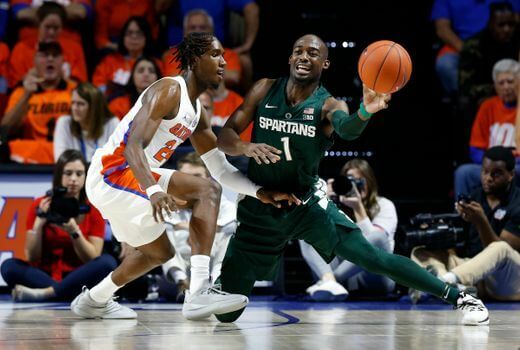 Michigan State held the Gators to just 30% from the floor in the first half, and held onto a single digit lead for almost the entirety of the second half in a 63-59 win in the O’Dome. With the loss, Florida falls to 5-4 in the year, still lacking a true resume-building win for the NCAA Tournament. The Gators actually got on the board first, just four seconds into the game when KeVaughn Allen hit a jumper off the opening tip. Allen then drained a three on the next possession to make it 5-0. And Michigan State took over from there, launching a backbreaking 20-5 run and never trailing again. The Spartans turned the ball over eleven times in the first half, but also shot 61% from the floor in that first half to build a 35-27 lead at the break, which they would extend to 39-27 in the opening minutes of the second. Florida would draw as close as 61-59 when Andrew Nembhard scores on a layup with 1:21 remaining, and the Gators got a stop on the Spartans’ next possession to set up a chance to tie. But Allen’s wild, off balance drive never had a chance, and his wild bullet off the backboard fell into the hands of Michigan State’s Xavier Tillman. One dunk for good measure by Kyle Ahrens later and that was that. The Gators- and Mike White- deserve all the credit in the world for the way they went after it defensively, sticking hands and feet into Spartan passing lanes, and fighting for boards against a much bigger opponent. For a team in need of such a complete and thorough overhaul, in which every aspect of the program needs to improve, getting tougher on defense was a good place to start. But this team is still extremely limited without a reliable post presence, and wins are going to be hard to come by on nights when the threes don’t fall. And it’s difficult to tell just how long this kind of product will be tolerated for.